LEN - www.lankaenews.com | Whopping Rs. 9200 million fraud ! 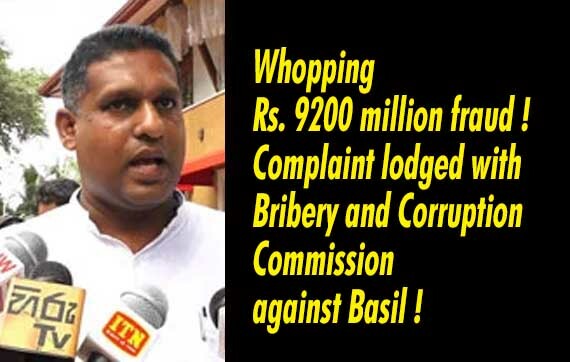 Complaint lodged with Bribery and Corruption Commission against Basil ! (Lanka e News -12.Aug.2018, 11.30PM) Under a project of the Water supply and drainage board owing to the pressures exerted by Basil Rajapakse , a fraud to the tune of US $ 57.5 million was committed , according to a complaint lodged day before yesterday (10) by a group including Attanagalle pradeshiya sabha member Dinesh Indika Rajapakse with the Commission to investigate allegations of bribery and corruption . The engineers of the Water Board had estimated a cost of US $ 172 million in regard to this project which was planned in 2012. While this was the estimated amount , this project was handed over without calling for tenders to a Chinese Co. –China machinery engineering Corporation Co. at a cost of US $ 229.5 million and the agreement was signed by the then chairman of the Water Board , Karunasena Hettiarachi on 2013-05-05. Though such an agreement ought to be signed by the ministry secretary , due to the pressures exerted by the then minister Basil Rajapakse , this agreement was signed even ignoring the established guidelines . Hettiarachi later became the defense secretary under president Maithripala Sirisena and currently he is SL ambassador to Germany. The complainant had stated in the complaint, because of this aforementioned project the government incurred a loss of US $ 57.5 million which in SL rupees is a whopping 9200 million !